We got the first half of the tower up today. I had assembled the first three sections and the baseplate earlier this week. Today we tilted up that whole assembly and got the first level of guy wires in place. Tilting up that first 30 feet sounded like a great idea. But it turned out to be surprisingly hard. I think maybe next time I will just tip up 20 feet and do the gin-pole thing after that. The gin-pole is kind of tedious but it is not really that difficult. The 30′ tilt up was physically demanding and may have been a bit too much for us. But we got it up. We used some ropes for getting it elevated and as temporary guys. Then we put our real guys together and got them installed (after me messing up the math… we had to add a bit more on the ends) It all turned out well. At the end of the day we have a 30 foot tower in place with real guys holding it up. Next step is to let the guys rest, tighten them up in a couple of days. 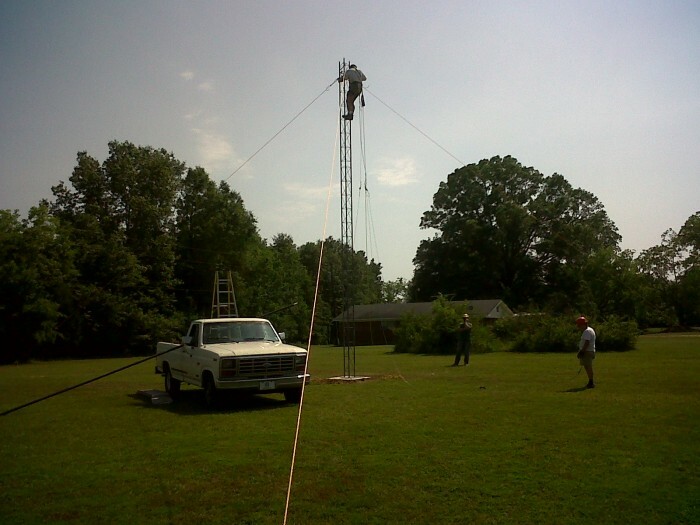 Then we will get the gin pole in play for three more sections to top out at 60 feet (and another layer of guys there), then rotator, mast, antenna, feed line,… the fun just keeps coming.